I always have trouble deciding what to make for dinner. I have made this mushroom curry twice and i absolutely love it. It goes well with rotis/phulkas. Though i haven’t tried the combination, i am sure it will pair well with any long grained rice as well. The recipe has been adapted from Mallika Badrinath’s – “100 delicious vegetarian gravies”. I have made the dish less rich to suit my palate. 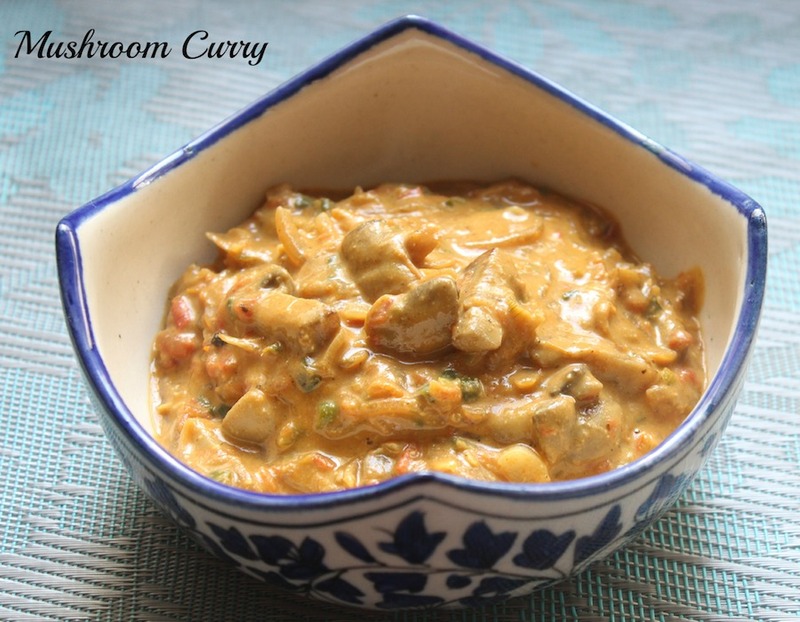 This version of mushroom curry is creamy and tasty. It pairs well with any indian bread. Grind the cashews to a fine paste. Keep the cashew milk aside. Heat 1 tablespoon of oil in pan. Fry the mushrooms till the water from the mushrooms evaporates. Keep the mushrooms aside. On a separate pan, heat the remaining 2 tablespoons of oil in a pan and fry the onions till it is brown. Now add the tomatoes and fry it really well, till its mushy and pulpy. At this stage, add the cashewnut milk and ¾ glass of water and boil well. Now add the cooked mushrooms and garam masala and boil once.